If only Arsenal had signed Higuain........Chelsea needed Rooney to win the league.....Madrid were mad to sell Ozil....... And so on. Is there any truth in these statements? You may want to stop reading here if you're looking for a definitive answer to any of the above or below questions, as I'm afraid we'll never know for sure. However, we can at least look at the impact of the players this season, along with the performance of the teams in question - it might at least give us some basis for a pub argument (non-violent of course). Well well well, that's not quite the obvious answer many were expecting. In the league, Higuain only has one more goal than the often criticised Frenchman. In fact, Giroud scored in more games than the Argentinian. Not so bemoaning now, are we bemoaners? Well yes and no. Whilst the actual number of goals are similar, the big difference comes in the level of opponent that Higuain has scored against compared to Giroud. Much of the criticism of poor old knackered Olly has been his impact in the big games - games where Arsenal effectively gave up their shot at the title by rolling over and having their belly tickled - and of course, (allegedly) making sweet sweet love to a beautiful woman who wasn't his wife, whilst in the team hotel. Admittedly, the defence need to have a long hard look at themselves, but it might have helped if they thought they could at least trouble the opposition. Amongst Higuain's victims were top sixers Torino (three goals) and Inter Milan. Add to that a further three against the once mighty AC Milan (the Italian Man United last season). Giroud? His one goal against Top 6 opponents was against Spurs - reflected in the average opposition comparisons. The grey area should be pointed out - Higuain would have had different team mates to get used to, the Italian top flight is a different style to the premier league, and so on, but it at least tells a story. Given Wenger has played with a lone front man (or in the middle of a front three), it's unlikely the two would have been paired had the Argentine signed last summer, but it certainly could have given Wenger some options, and certainly in the big games. Yaya Sanogo may have a bright future, but I'm sure Wenger would have rather started the Bayern Munich game with Higuain instead him. If you can overlook the fact that Bale cost around double the price of Ozil, it certainly makes for interesting reading. Granted, these stats don't show the pass before the assist - often the most important - so we could be doing Ozil a disservice here, but you can sort of see Madrid's thinking. Once again, it's hard to compare directly as they play in slightly different positions and are in different leagues, but if you compare Ozil's 2012-13 assists to Bale's 2013-14 assists - for the same team against largely the same opposition, then it's a pretty close run thing. Ozil has one more and in one game less. He also has one more against Top 6 opponents. But this was Bale's first season in Madrid and almost a third of Ozil's assists in his last season for Madrid were against the teams at the bottom. Chuck in the goals and it's a clear win for Bale - maybe even a double your money win if you take into account exploits in Europe (a decisive goal in the final, an assist in the semi). It'll be interesting to revisit this comparison again next season - if someone reminds me. And so onto the third claim made in the intro; Chelsea would have been better off with Rooney. 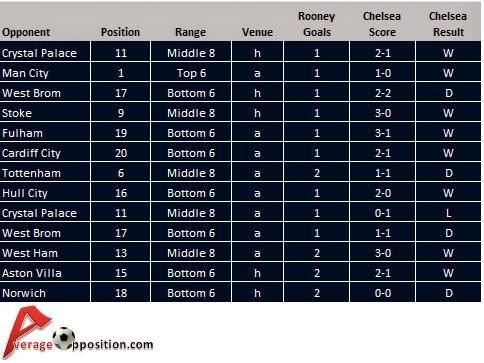 A slightly different approach this time - a look at the opponents Rooney scored against compared to how Chelsea fared against them. As with above, it's not a perfect science, but might help settle a debate. Rooney is thought to have been one of United's stand out players in what has been a shocking season for them. But has he really been that good (£300k a week good), and would he have helped Chelsea win the league? Yes. Sort of. I know that it's a very flawed approach and it omits a whole host of factors, but simply put, Chelsea dropped 11 points against teams that Rooney scored against last season, his goals in that team could have been the difference between winning the league and not - as Chelsea finished just 4 points off the top. What does make bad reading for Rooney is that he only scored one goal against Top 6 opposition last season, but that wouldn't have been a problem for Chelsea who dominated against the other teams around them. It was against the likes of West Brom (4 points dropped) that they struggled. An interesting 'what if '. Statistically, Chelsea's strikers (Ba, Eto'o and Torres) contributed a combined 19 league goals - just two more than Rooney. With the World Cup fast approaching, the Man United front man needs to step up his performances in the big games - and based on last season's opposition per goal, it doesn't make for great reading for Rooney (City aside). I certainly want him to do well, having recently started to lose my own hair, I feel a connection to the talismanic front man. So there you have it, clear as one of those funny pictures with loads of dots on that just look like a load of dots until you really squint and concentrate and eventually see something that isn't just a load of dots. You can do that with a lot of statistics as it turns out. Realistically, none of it can be proved definitively but the above might at least give an opinion some legs. Or some more hair on that pesky thinning bit.